In case you missed it, please check out the link in this tweet. 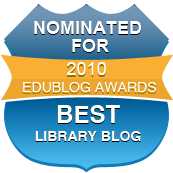 It's the same mizzmurphy blog I cited as giving a TL's view of the interrogations: Are teacher librarians teachers? The same teacher librarian whose phrase, "the nuanced beauty of pedagogy" I admired, and shared this week with one of our seniors who is planning to be a high school history teacher. What happened next? Read and find out.